aluminum cap or extrusion and drilled some test holes into the core. The bit brought up water and mush! not to pursue this avenue for my boat. a perfect medium for the dual core radiused transoms on MFG boats. to insure a good bond to the skins. the interior of the skins down to the fibeglass. I used a 3/8" drill bit chucked into an extension that allowed me to drill down to the bottom. I found that by drilling out the center of the core, I was able to pull out large pieces of the plywood. It just takes a lot of patience, but it works. let it sit out in the sun for several days with fans on it. 'floating blocks' that just sit on top of the core. come down below the ski tow eyes. I drilled the inner and bottom edges so that the Nida would flow into and "peg" these pieces. 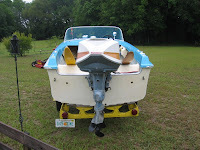 I wanted to make sure the transom was as level and verticle as possible, so I put the trailer tongue on the ground and jacked it up as high as possible in the rear. This allowed me to level and have a solid work platform and get the transom as verticle (front to back) as possible. I used metal duck tape to cover my motor bolt holes from the outside and plugged them from the inside with Kitty Hair and resin soaked cloth. it easier on me as I was working alone. Everthing went perfectly! The Nida flowed into the aft area between the floor and hull and solidly filled this area. Pouring it to the top was a snap and the whole process mixing, pouring and all took less than 30 minutes. As the material began curing, it generated so much heat that I had to leave the shop. I could feel it about 2 inches forward on the sides and maybe six inches on the bottom. this means that the Nida flowed into this below floor space and gave me a much better anchor to the rest of the hull than the original transom. The next day I cleaned everything up, used a little Kitty Hair to fill in the quarter inch or so of void I had on the front edge of the transom. (You would have to get the transom perfectly verticle to avoid this) and screwed the extrusion back on. A little scrubbing and wax, and you cannot tell the boat has been worked on. this was a must for me, as I am not a cosmetics kind of guy. Here is the end result. What's an old (vintage) boat worth? Certified ORG. (Old Retired Guy). Fishing, boating, reading.